TESTIMONIAL: The best boat I've owned – without question! The best boat I’ve owned – without question! I’ve had 13 boats over the past 10 years and my Bar Crusher 615WR is the best boat I’ve owned – without question! The other boats have ranged from pressed aluminium tinnies to large fibreglass boats, in configurations from centre consoles to centre cabs, and sizes spanning 6.2m to over 8.5m in length. At 6.15m LOA, my 615WR is the smallest boat I’ve owned, but it’s so much better than all the others. It’s remarkable how it handles for its size, where I can go in it and what I can do with it. 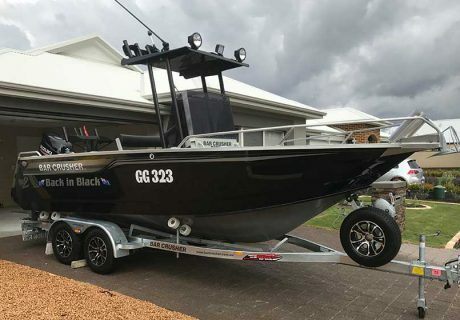 From offshore bottom bouncing for reef species, jigging for samsonfish, trolling skirted lures for tuna and hard-bodied lures for mackerel, right through to light tackle estuary fishing for whiting and bream, it’s an incredibly well-handling and super-versatile fishing boat. When ordering my Bar Crusher, I requested it be built with a full flat deck all the way to the bow (forgoing the raised forward casting deck that’s standard on the 615WR) as this better suits my fishing style. Fitted with a 140hp Suzuki outboard, Furuno electronics and personalised with plenty of options, it’s almost too easy to get fish! I’ve put over 100 hours on Back in Black in the six weeks I’ve owned it, so it gets plenty of use and will be getting plenty more. If I upgrade to any form of a trailer boat in future it will definitely be another Bar Crusher!